In the late 1920’s, a time when the lynching of black men is an accepted and widespread form of racial oppression, a black Chicago journalist travels to the deep South to interview a Kleagle, a recruiter for the Ku Klux Klan. The reporter, passing for white, aims to change American public opinion, which has tolerated—often supported—Klan terror. But first he must succeed in his deception—and survive. However, his true racial identity is discovered by the Klan. This production is about this moment. Velocity equals distance over time. A simple equation until you are falling 73 stories from your office tower with your wife and daughter cheering you on. No matter how it tumbles, life's a circus, a carnival...or maybe just an overblown physics experiment. I Can Cry by Miri Ben-Shalom. On May 7, 1945, on her 20th birthday, American troops gave Erna a wonder-ful gift... freedom. Now in her seventies, together with her 14-year-old younger-self, she re-lives her journey of endurance through the Holocaust. This theatrical documentary, with integrated documentary footage, tells the story of millions through one woman's poignant personal odyssey. 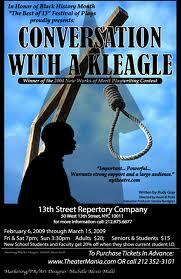 Conversation with a Kleagle ... A KKK Recruiter by Rudy Gray was given 3 productions by 13th Street Repertory in NYC as a direct result of development workshop readings produced by New Works of Merit Playwriting Contest. Conversation with a Kleagle is being turned into a film written by Rudy Gray and Sandra Nordgren. "Conversation with a Kleagle is one of those rare shows important enough and powerful enough to warrant strong support and a large audience." "Conversation with a Kleagle is a riveting and memorable profile in courage, and it tells a story that's important to our collective history and character." "Conversation with a Kleagle offers a vivid glimpse of the ubiquitous Ku Klux Klan's lynching culture in the Deep South during the Coolidge administration." "This play would put meaning back into Broadway." "This is better than most of the shows on Broadway!" "Incredible! The actors put their heart and soul into the play." "This is an important play about Black History." Conversation with a Kleagle received a workshop reading with Q & A at 13th St Rep January 30, 2013. Velocity received a reading with Q & A at 13th St Rep on April 10, 2005.